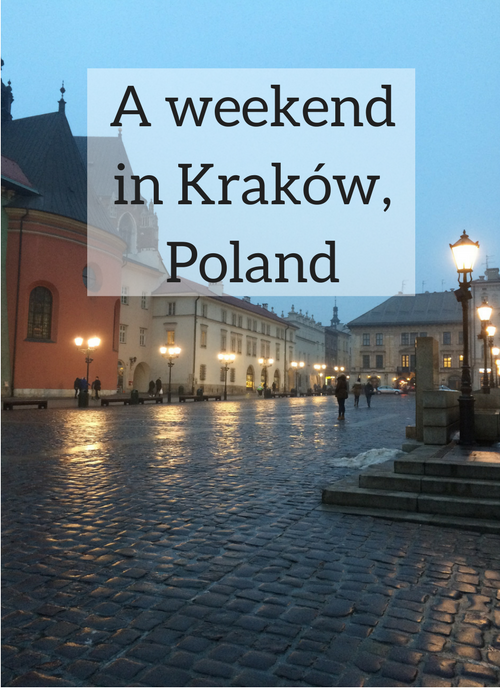 I’m just back from my first ever trip to Poland – I spent the weekend exploring the beautiful city of Kraków, the country’s former royal capital. As my flight was leaving at a very early hour on Friday morning, I booked a hotel and parking package through Holiday Extras (my trip sponsors). So I had a comfortable night at the Premier Inn Heathrow Airport, then it was just a short drive to the terminal the following morning. I left my car with a lovely Meet and Greet driver (Meet and Greet parking is a marvellous thing, and the drivers are all lovely in my eyes) and strolled across to the terminal building. I’d checked in online and was travelling with hand luggage only (the 8kg weight limit was a challenge – read about how I managed it here) so was through to the departure lounge a few minutes later. 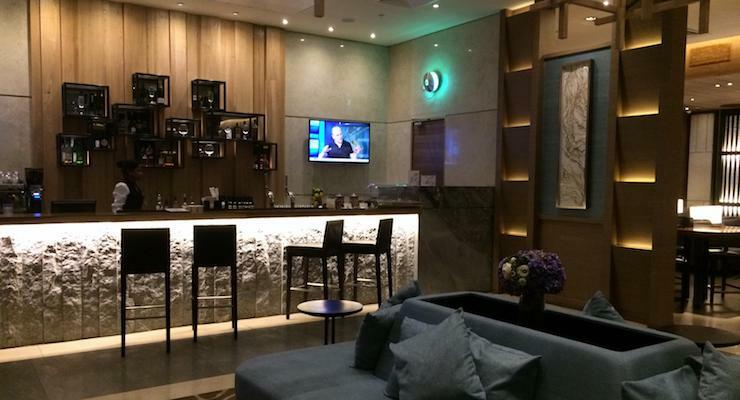 I had breakfast at the very swish and relaxing Plaza Premium Lounge, again booked through Holiday Extras. There were just four other passengers in the lounge, and it was great to have a comfortable, peaceful place to wait for my flight. The wifi was decent, there were newspapers and magazines to read and a good selection of things to eat and drink. From Kraków airport I took a shuttle to my base for the weekend, Hotel Kossak, a four-star boutique hotel just outside the the historic city centre. It’s just a few minutes’ walk from the hotel to Wawel Hill in one direction and to the old town in another, so the location is great. Once I was settled in, I wrapped up warm (it was 3 degrees outside) and set off to explore the city with local guide Anna Hejda. 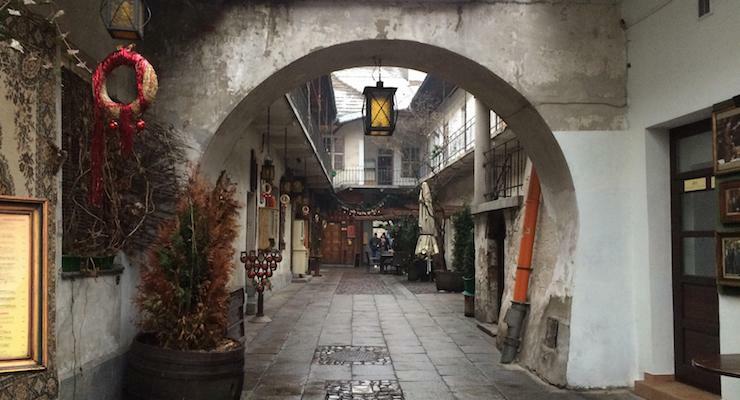 Our first stop was Kazimierz, the city’s Jewish quarter, which we travelled to by tram. There were around 65,000 Jewish people in the city before WWII, but the Nazis moved them to a ghetto on the other side of the River Vistula and then most of them were killed in the holocaust. Only around 6,000 of Kraków’s Jews survived the war, but their synagogues, streets and former homes are still here today, and it’s an evocative place to walk around. We saw a statue of Jan Karski, a member of the Polish Resistance who witnessed the extermination of Jews by the Nazis, and managed to meet Allied leaders to brief them on what was happening. We also saw some buildings where scenes from Schindler’s List were filmed, although Anna pointed out that these buildings weren’t actually part of the WWII Jewish ghetto. We walked from here to Main Square, the heart of the city. We arrived in the square at dusk, and the beauty of the place left me speechless. The square looks huge – it measures 200 metres by 200 metres – and it’s surrounded by historic buildings. It was laid out in the 12th century and at its centre is the Cloth Hall, a Renaissance building which is one of the world’s oldest shopping malls. Inside the Cloth Hall there are are stalls selling some fantastic crafts and souvenirs, at very good prices. Every hour on the hour there’s a bugle call from highest tower of St Mary’s Church, at the edge of the square. The bugle cuts off mid-phrase, and the story is that this has been happening ever since a watchman was killed by an arrow to the throat while he was sounding the alarm from this tower. St. Mary’s is one of the city’s most important churches and it has an ornate gothic interior. You need a ticket to go inside, plus an extra ticket if you’d like to take photos. A highlight is an enormous altar which the Nazis took to Nurmberg during WWII, but which survived the war and was brought back here afterwards. 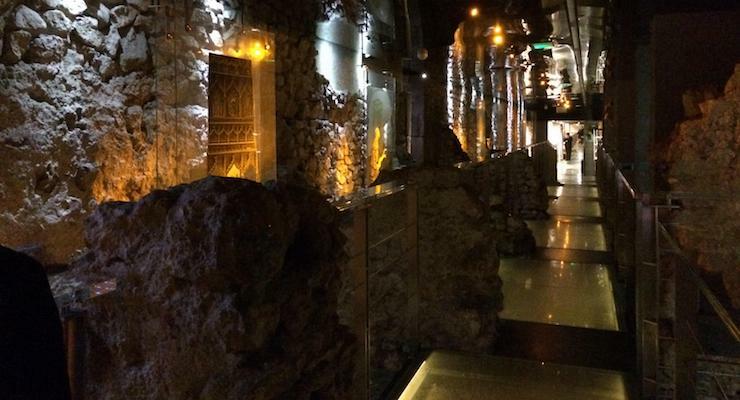 Our last visit of the day was to Reynek Underground, a marvellous archaeological exhibition which is four metres below Main Square (you definitely need a coat down there). Originally the land here was marshy, and many items were lost and preserved here over the centuries, covered up with the layers of sand and stones which were used to dry out the terrain, ready for today’s archaeologists to discover. We saw medieval market stalls, cobbled roads, wooden kerbs, and the remains of wooden buildings destroyed by fire, as well as objects found here such as wooden lice combs, children’s rattles, leather shoes, coins, tools and jewellery. The exhibition makes great use of modern technology, with holograms, sound recordings, video and interactive exhibits such as scales where you can weigh yourself in old units of measurement. By this point I was pretty tired, so headed back to my hotel, ordered room service for dinner and went to bed. By now I was really cold, and could barely feel my hands. 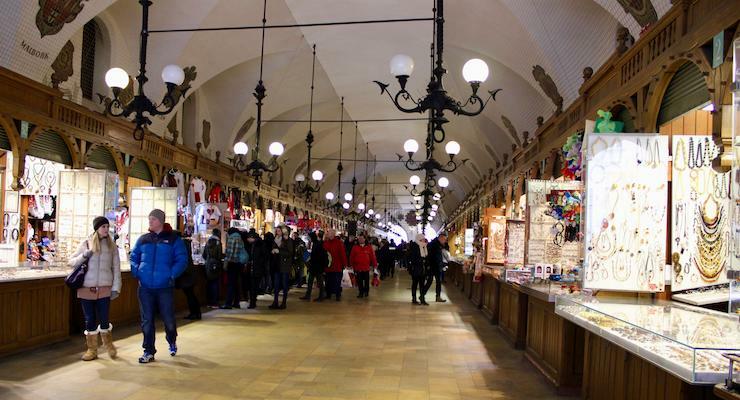 I went inside the Cloth Hall to have a proper look at the stalls and do some shopping. I bought some gorgeous pale grey sheepskin gloves which cost around £10. I also bought a small carved wooden horse as a souvenir and some amber and silver jewellery as gifts. I liked the traditional blue and white hand-painted Polish ceramics too, but was constrained by my luggage allowance, so didn’t buy any of that. I was still cold so went into a cafe to warm up with a hot chocolate and look at a map. Then I walked to Collegium Maius, one of the city’s oldest buildings. 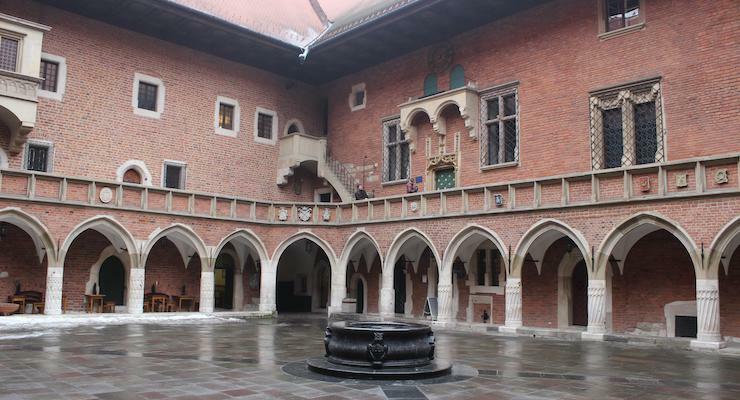 It was built as the Jagiellonian University’s main campus in the 14th century, and Nicolaus Copernicus studied there. It has a beautiful arcaded courtyard which you can go into and walk around. There’s also a museum which sounds fascinating, but it’s closed on Saturday afternoons, so I wasn’t able to go inside it. From here I walked to Wawel Hill, guided by Google Maps. Wawel Hill was the seat of Polish royalty for more than 500 years, and is home to Wawel Castle and Wawel Cathedral as well as a clutch of other historic buildings. The castle was closed, but I went inside the cathedral, considered one of the most important buildings in Poland. There’s been a cathedral here since about 1020, and most Polish monarchs were crowned here, so it’s a very interesting place to visit. I particularly liked the marble statue of Queen Jadwiga with a whippet sleeping at her feet. If you go, look out for the enormous bones suspended to the left of the entrance – according to legend, these are dragon bones with magical protective powers. I climbed the steep, narrow wooden steps of the cathedral bell tower to see the huge Sigismund Bell, which was cast in 1520 and weighs more than 12 tonnes. The bell rings only on national holidays and important state occasions, and if you touch it and make a wish, it may even come true (I’ll let you know if mine does). From the bell tower there are views across the city, but it was a bit too foggy for me to see very far. Back on the ground, I walked through the castle’s marvellous 16th century arcaded inner courtyard, designed by Italian architects. 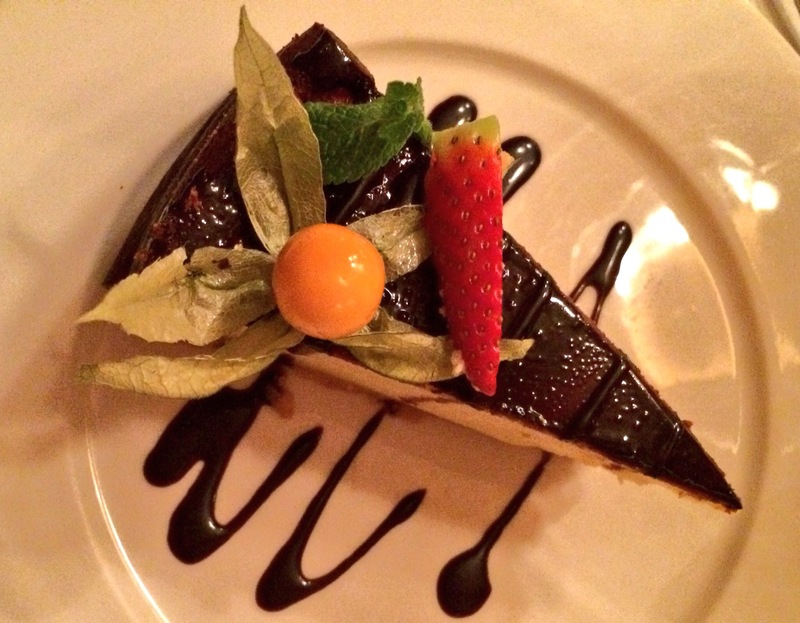 I had dinner at Miód Malina, a traditional Polish restaurant in the old town which had been recommended to me. It has a cosy, homely atmosphere and colourful interior. I was looking for traditional Polish food, without meat. On the waiter’s recommendation I chose pancakes with a creamy mushroom sauce, followed by cheesecake, and it was all very good, and very reasonably priced – the bill was about £8.00. After breakfast at the hotel I checked out as my flight home was that afternoon. 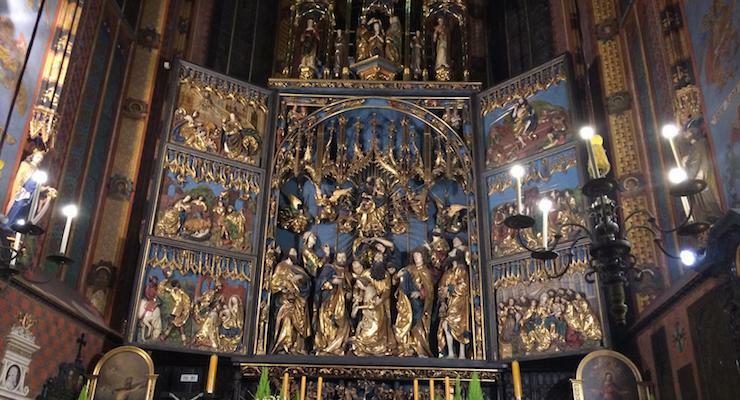 There were so many things that I still wanted to see and do in Kraków, but I didn’t have time to do everything. It was a difficult choice, but I decided to leave Wawel Castle, Wieliczka Salt Mine, Auschwitz, Podgórze, the Kosciuszko Mound and Nowa Huta for another time, and go to Schindler’s Factory instead, accompanied by Anna, my guide from two days earlier. This outstanding museum covers the Nazi occupation of Kraków during WWII, and is housed in the former factory of Oskar Schindler, whose story was made famous by the book and film Schindler’s List. I’ve written a full review of this museum in a separate post: Oskar Schindler’s Factory, Kraków. In case you don’t know the story, at the start of WWII Schindler was a German industrialist and spy who took over a Jewish-owned factory and used Jews as cheap labour. Over time he changed as he saw what the Nazis were doing to the Jews. Eventually he built a labour camp for his workers near his factory, thus protecting and saving 1200 Jews. The exhibits at the museum are well organised and enlightening, and I could have spent a whole day there taking everything in. I’d definitely recommend this museum, although maybe not for young children. Back at the hotel I collected my bag and took a shuttle to the airport for my afternoon flight to London. Shortly after landing at Heathrow, thanks to Meet and Greet parking, I was in my car and driving home. I really enjoyed my trip to Kraków, and would definitely recommend it for a short break. The highlights for me were the Schindler Factory, Reynek Underground and shopping at the Cloth Hall. 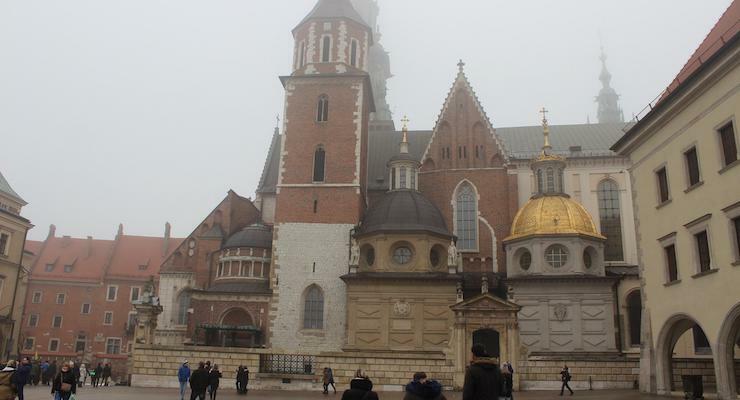 It was pretty chilly in Kraków, but also quiet and uncrowded, which meant that I didn’t have to queue for anything. I’d love to go back to Kraków another time, because there’s so much more to see in and around the city. I liked were I stayed, Hotel Kossak and would recommend it. You can read more about my trip in my post Oskar Schindler’s Factory, Kraków. I recommend the Lonely Planet Poland (Travel Guide) , which I used for this trip. Have you been to Kraków? Do you have any tips to share? Is this somewhere which you’d like to visit? Disclosure: My trip to Kraków was sponsored by Holiday Extras, although the itinerary, words, images and opinions are all my own, as ever. This post contains affiliate links, which means that if you clicked through and booked I may receive a small commission. How great to go there for your degree – what did you study Nichola? Sounds like such a great place for a city break – such a long time since I visited but I’m sure we didn’t fit in nearly as much as you. I’m also very impressed you managed with that weight limit in such chilly weather! I wore layers of clothes for the flight – and I bought warmer gloves when I got there, as my dainty cashmere ones weren’t up to the job! Wow Gretta, you really did go full pelt and explore! I can’t believe you crammed in so much in just a weekend. Krakow sounds so interesting – I think I would really like it there. My gosh though it sounds and looks so cold!! It was pretty cold – but the only time I really felt it was when I was standing still for 20 minutes doing the Facebook Live video. The rest of the time it was fine! It sounds like an absolutely fascinating place to go for a break Gretta – and somewhere, as you say, you could go back to again and see more and more. It’s a really interesting place Sarah – I think that you and your family would like it there. 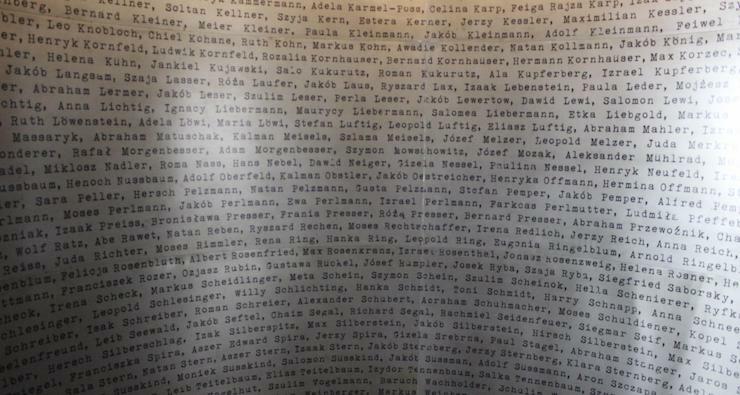 Schindler’s List is such a powerful film – it’s over 20 years since I watched it, but the memory of the street in your post is still vivid. This sounds like a fascinating visit. I’ve enjoyed following it on social media. Thanks Nell. I need to watch Schindler’s List again now that I’ve been to Kraków. It looks a very interesting place… would love to visit.. I think you’d really enjoy it there Jenny. 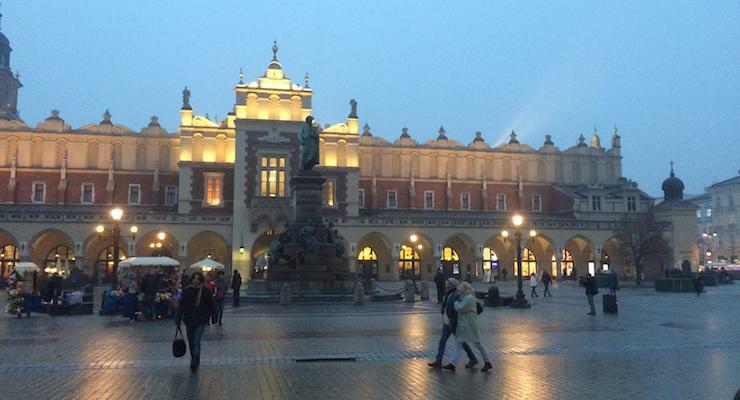 It’s a long time since I was in Krakow but I remember it very fondly – such a beautiful city. We did have a few days trips to Wielizcka and Auschwitz, so less time in the city itself, and would be amazing to go back and explore a bit more. I’m impressed how much you packed in – and that you managed with an 8kg luggage allowance in winter!